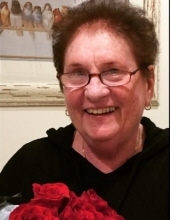 Diane E. Bolio, passed away peacefully on Monday, April 15, 2019 surrounded by her loving family. She was 81. A lifelong resident of Morristown, NJ, daughter of John and Eileen Keyes. Diane was married to the love of her life, Nicholas Bolio, for 55-years before he passed in 2011. She enjoyed cooking, baking, and summer getaways toher beach house in Point Pleasant. Most of all, Diane cherished the time she spent with her family. She loved watching the next generation grow, andexperiencing life again through their eyes. She is survived by her son Nicholas Bolio Jr., and wife, Karen, and daughter Diane Ryan and husband Michael;both of Morristown. Also survived by her cherished grandchildren, Michael, Nichole, Justin, Nicholas III, and Mike Fiorella; Siblings Robert Keyes and his wife Kathy, Joan Kuhn, Caryl Krajewski, and Michele Bodino, as well as many nieces, nephews, and their children that she loved so dearly. The Liturgy of the Word will be celebrated at the Church of the Assumption, Morristown on Thursday at 10:00AM. Visitation at the Doyle Funeral Home, 106 Maple Ave., Morristown on Wednesday from 4-8PM. To send flowers or a remembrance gift to the family of Diane E. Bolio, please visit our Tribute Store. "Email Address" would like to share the life celebration of Diane E. Bolio. Click on the "link" to go to share a favorite memory or leave a condolence message for the family.